A few weeks ago, the religious interwebs were a-hum with chatter about a proclamation by theoretical cosmologist Stephen Hawking that the universe could easily have blorted itself into being without any help from a creator. There was much tut-tutting, from both the lumpenproletariat of Christianity and Episcopalians. Of course you need God, cried Christianity! Laws may be one thing, but there must causality beyond simple mechanics. God gives both being and purpose, proclaimed the voice of the church, and Hawking just doesn't get it! In responding thusly to Hawking, I'm afraid it is the church that has entirely missed the point. We're having the wrong argument. We're standing in a room, talking to ourselves, and have failed to engage Hawking in any meaningful way. What is most notable about what Hawking has to say is not that he doubts that God is necessary as a first cause or Aristotelian Unmoved Mover of our spacetime. There are plenty of scientists and atheistic folk who've been doing this for years. What his book is doing is far more radical. It's challenging the conventional understanding of the universe. Those of us Jesus People who aren't taking huge brain-choking hits off the Young Earth Creationist Bong typically understand the universe as having come into being with the Big Bang, that inexplicable surge of Something into Nothing. There are many sentient Christians who have no difficulty adapting their faith to this prevailing cosmology, seeing how easily and elegantly this meshes with our Biblical stories of creation. We see God at work behind that glorious, impossible event. In the early days of modern astronomy, though, there were two competing views of the suddenly-very-much larger universe. A significant group of early scientists held...based on available observations...that the universe was solid-state, permanent, and never-changing. The universe had never been created. It had simply always been. From the standpoint of the narrative of Christian faith, this solid-state cosmology was completely and totally at odds with the idea of God as creator. It was a major conceptual threat, for had it been proven to be true, the whole narrative of Biblical faith wouldn't even have worked as metaphor. The two positions were conceptually irreconcilable. As it happened, though, further and more accurate observations showed that the vast panoply of stars and galaxies had not always been there, and that they instead Banged out Bigly Billions and Billions of years Before. So...the universe had arisen from nothing, or at least out of a state of being that was inherently not empirically observable and thus beyond the reach of science. We theists, as the kids say these days, was down wit' dat. But the proposed unified theory that Hawking is presenting represents a significant shift in cosmology. The "M-theory" proposed by Hawking and others suggests, from the findings of quantum physics, that our spacetime is but one of a potentially infinite array of spacetimes. This is a sea change in the way that we understand existence and the nature of being. 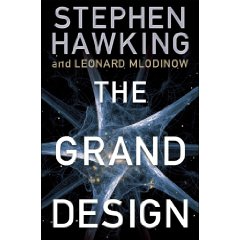 Clearly, Hawking and his co-author Cal-Tech physicist Leonard Mlodinow feel that this theory renders God irrelevant. But they're theoretical physicists. Theology ain't their thing. They do not, as my wife's rabbi might say, know from faith. So for the next few blog posts, I'm going to read through The Grand Design and muse over M-Theory. Is it, in fact, a threat to Christian faith and/or the belief in God in the same way that a solid-state spacetime would have been? Or is it a cosmology that believing and sentient Christians can integrate authentically into our faith, in the same way that we've had no trouble integrating Big Bang theory?